Louise Lovell Jewellery01600 780460work Shop - JewelleryI design and make textile based jewellery, working from my studio in rural Monmouthshire. I am a firm believer that a piece of jewellery should make a statement ‘say’ something about the wearer, and as such be unique.I work with a passion incorporating many elements into my work – hand stitching pieces using my digitally designed and printed fabrics, miniature hand knitting, buttons, beads, vintage jewellery and found objects whatever is appropriate for the look I am trying to achieve. My inspiration comes from my love of nature, textiles and anything that prompts an idea be it a piece of china, an old book or a happy memory! I source images for my digitally printed fabrics from my photographs, old postcards, perhaps a pattern on a jug or an appropriate piece of text. These now have become little cameos with picot knitted frames, birds, butterflies and hearts. Delicate flowers are knitted on very small knitting needles using a variety of fine yarns many of which I have dyed to obtain just the right colour. 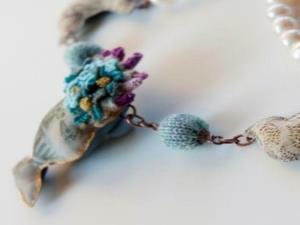 I design and make textile based jewellery, working from my studio in rural Monmouthshire. I am a firm believer that a piece of jewellery should make a statement ‘say’ something about the wearer, and as such be unique.I work with a passion incorporating many elements into my work – hand stitching pieces using my digitally designed and printed fabrics, miniature hand knitting, buttons, beads, vintage jewellery and found objects whatever is appropriate for the look I am trying to achieve. My jewellery is very feminine and can become highly decorative.